Here at Looker, we're on a mission to empower people through the smarter use of data. To do this, we continue to build, test, and evolve to ensure we're supporting companies throughout their data journeys. Building on our platform, we’re breaking the mold of traditional BI tools to deliver operational insights and provide experiences that are unique to the needs of users. A relatively new way we’re doing this is through pre-built, use case specific applications. We love working with all types of companies to help them understand the best ways to leverage their data and empower their users. While we’ve seen thousands of custom metrics and unique technical stacks, we’ve also noticed many companies spend time defining and building some of the same, almost identical, types of analyses. To help both our analysts and business users self serve and simplify these specific analytical needs, we codified these metrics into out-of-the-box data models based on what we’ve learned from these use cases. By presenting these analyses in this way, it becomes easier for more people to make business decisions backed by data. That is why we are building applications on top of the Looker platform. Applications are customized data experiences for specific use cases. From within a Looker deployment, applications make it easy to get your stack up and running with quick time-to-value, no matter your level of technical expertise. Built to simplify self-service analytics, they remove the upfront effort for users with a common need because they are plug-and-play, purpose-built, and designed for scale. Different than implementing a whole new tool, applications are an extension of a Looker deployment. This enables user groups with specific data needs to set up and begin using applications — no technical skills or wait time required. Applications help to quickly surface the most valuable, actionable insights for common-use case data. And just like what’s possible with Looker, you can add in your specific KPIs to customize metrics, reports, and functionality. Because they’re built on top of the Looker platform, applications can support growth while continuing to address complex, cross-functional questions, empowering continued data-discovery. At our annual JOIN: The Tour London event, we announced our new Sales Analytics application. Customers who were previously using disperative sales analytics tools can now bring all their sales data together for a unified view in Looker. Sales efficiency has one of the greatest impacts on an organizations’ bottom line, yet sales management, representatives, and even operations specialists are not always data-driven roles. Sales professionals are often skilled communicators, hard-working, creative thinkers — imagine the possible results if they were also data-driven? With our new Sales Analytics application, we aim to deliver actionable data to members of the sales team to empower them to prioritize leads and deals as well as to improve pipeline visibility and reporting. 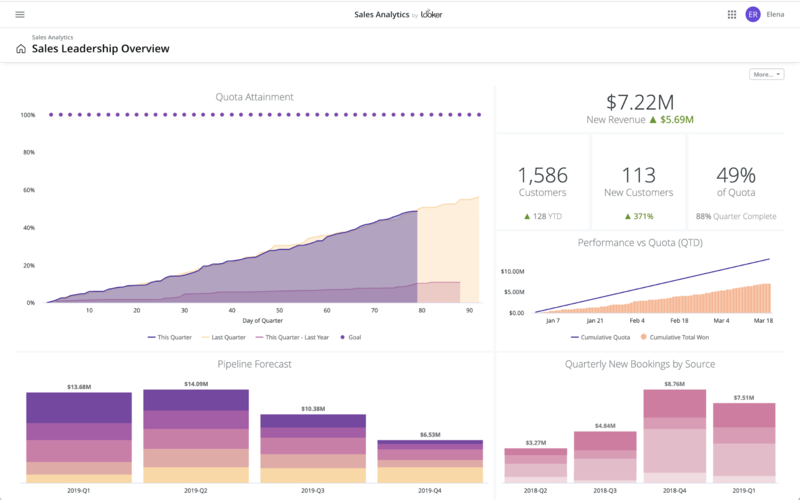 This application provides pre-built dashboards and reports that leverage the best practices we’ve learned from years of helping companies do sales analyses. Users have a complete view of sales data, without the limitations of trying to report directly within a CRM. For sales managers, this means you can monitor quota attainment throughout the quarter to see how far under — or above — your team is on track to perform, allowing you to make adjustments before the end of the quarter. With the custom visualizations and reports, you can view your entire forecasted pipeline, identify what sources are leading to the newest bookings, and can provide accurate updates on recently closed customers and revenue. In addition, sales representatives can leverage personal dashboards to track their individual contributions towards team goals such as lifetime bookings, new customers signed, and percent to quota. The leaderboard dashboard can be used to identify top performers throughout the quarter, surfacing opportunities to share best practices. In addition to empowering sales teams with data, we’re excited to continue our work helping marketers get more bang for their budgets. With digital marketing spending expected to increase from 44% to 54% in the next five years, it’s more important than ever to make decisions with data. 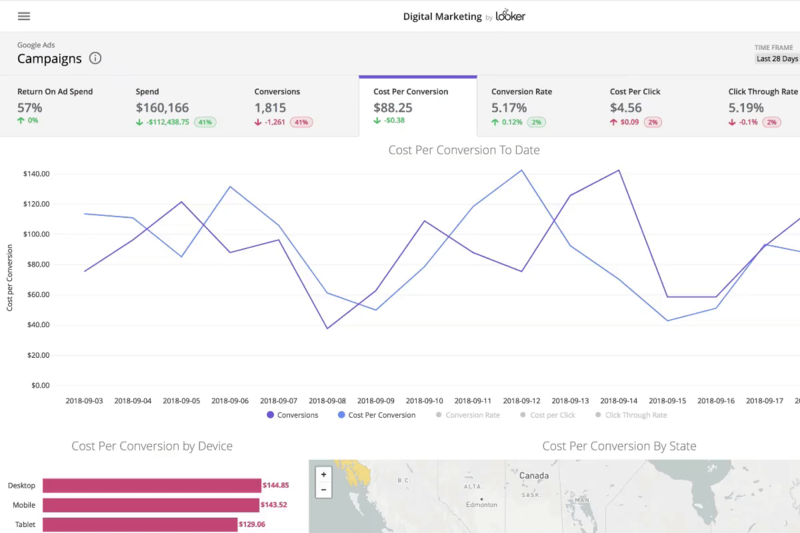 To address this and help our customers succeed, we’re excited to announce that the Looker for Digital Marketing application is now out of beta and generally available. Marketers no longer need to waste time and budget sorting through spreadsheets for stale data. With the Digital Marketing application, marketers have a single spot to go to better understand campaign performance, conversion rates, and ad spend. This application comes with customizable reports for analyzing ad performance from sources such as Google, Facebook, Bing, Pinterest, and LinkedIn. It also provides suggested optimizations to help you identify and double-down on top performing ads, or lower and stop bids on poor performers — directly from within the Looker application. With the ability to immediately analyze and act on metrics, digital marketers can focus in on the methods, mediums, and messages that contribute to the most successful campaigns — rather than trying to sort through spreadsheets. 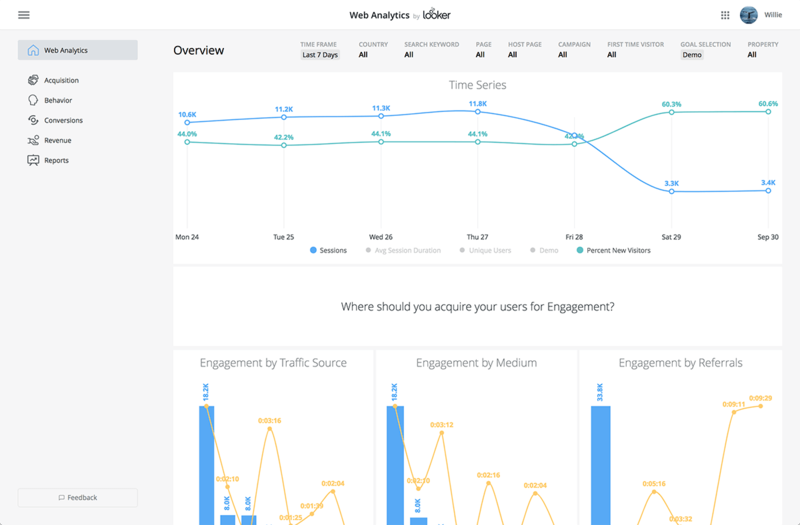 Our Looker for Web Analytics application is also now generally available for marketers aiming to optimize their website. For companies with multiple websites, this application equips your web analytics team with the necessary reporting functions and dashboards to stay on top of all your website metrics. With the Web Analytics application, users can analyze and compare traffic for multiple domains, understand user-level detail, and optimize the entire web experience. If you’re a web analyst or optimization specialist, using this application gives you the familiarity of what you know within a customized experience. Built with the reports you already rely on from Google Analytics 360, it allows you to perform cross-property analysis down to the user level. Drilling into these metrics within application gives you the ability to better understand more about your unique or most frequent visitors across domains, locations, and campaigns. Whether you’re already a customer or you’re brand new to Looker, we’d love to hear from you. Learn more about our Web and Digital Marketing applications or reach out to get more information regarding our Sales Analytics beta program.